Awaken to your passion with Janet Attwood, co-author of the bestseller, The Passion Test and expert in living a passionate life. I always wanted something like this! 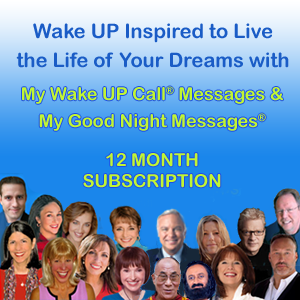 Wake UP to Your Passion with messages from best-selling author, Janet Attwood! Daily tips, inspirational stories and affirmation to awaken you to your life’s passions with Janet Attwood! Co-author of NY Times bestsellers, The Passion Test. Awaken to your passion with Janet Attwood! Co-author of NY Times bestsellers, The Passion Test and From Sad to Glad, Janet is a leading expert in living with passion. Janet is the co-author of the New York Times Bestseller, The Passion Test – The Effortless Path To Discovering Your Life Purpose, and co-author of From Sad to Glad: 7 Steps to Facing Change with Love and Power. As an expert on what it takes to live a passionate life, she has shared the stage with, The Dalai Lama, Sir Richard Branson, Jack Canfield, Lisa Nichols, and other top transformational leaders. Janet’s programs include: The Passion Test Certification and The Passion Test for Business, with facilitators from around the world. For her ongoing work with homeless women and youth in detention centers, Janet received the highest award for volunteer service in the U.S. from the President of the United States, The Presidents Volunteer Service Award. Janet is co-founder of one of the largest online magazines in the world, Healthy Wealthy n Wise Magazine. Twice a month Janet hosts HWnW “Passion Series” where she has interviewed people like Jack Canfield, Michael Beckwith, Byron Katie, Wayne Dyer and others in the top of their field on what it takes to live a passionate life. She is a certified facilitator of “The Work of Byron Katie”. Janet is President of an organization in India, called, “The World United” whose sole purpose is to promote conscious, healthy and sustainable choices for a better world. Janet is a founding member of the Transformational Leadership Council that Jack Canfield, the co-author of the Chicken Soup Series, put together after taking Janet’s Passion Test.